Gas and electric hot water heater troubleshooting and repair guide tips for homeowners. How to troubleshoot the element leaking, when pilot light goes out, sediment build-up, rotten egg smell, noise problem, rusty hot water, thermocouple issues, no hot water, not enough hot water, problems related to tankless water heaters and many other issues. The water heater troubleshooting guide will help you learn about common problems that might happen to your heater, how to recognize the symptoms for easier troubleshooting and what is needed for successful repairs. As reported by the users and experts, some problems are simple and easy to fix by a handyman. The most frequent problems can be found here with the explanation on how to fix them. As long as you have some plumbing, electrical and gas skills, and the right tools, you can do the repairs without calling a service company. For those homeowners who are not handy or problems are way too risky and complicate to repair, the recommendation is to contact a plumber. The following symptoms and problems are common on tank-type units using both fuel types; electricity and gas. Keep in mind that both natural and propane gas units are more complex machines than electrical so troubleshooting is more difficult, time-consuming and cost more. Common problems and solutions of both types can be found below, while some issues that are specific to each type can be found in the articles about troubleshooting electric type and gas units. The first step is to collect information on the problem that occurred, understand the issue or check out why one or more elements didn’t function properly. One of the frequent complaints about water heaters found on forums and in many user reviews is the puddle of water found under the unit. Most of the time, leaking from the top or bottom are some of the causes. The reasons for the leak could be the rusty tank, the TPR valve discharges an excessive pressure, loose fittings/connections, and damages on the pipe. Or, condensation. How to fix water heater leak is one of the problems this article will deal with. Almost every heater is affected by the hard water and this is what increases chances of reduced efficiency and performance, or even worse - premature tank failure. Cleaning sediments out from the heater regularly is what eventually saves money, as the water heater performs better and more efficient. Sediment build-up affects the performance of your water heater, can cause the rotten egg smell and annoying popping noise. This water heater troubleshooting article will cover ways on how to control the sediment build-up and how to remove it. Check out how and why the quality, color, and taste of water inside the hot water tank is changing. This troubleshooting guide will cover problems that are related to milky, discolored, and rusty hot water and how to repair it. Smelly water is an unpleasant problem. You open the hot water tap and there is a terrible sulfur odor that smells like rotten eggs. How to troubleshoot rotten egg odor and how to prevent it, is what this article will cover. Is your unit making ticking, popping, sizzling, pounding, humming or clicking noise? Or the plumbing pipes are making a loud noise which is known as water hammer? Read further to learn more about the water heater noise and steps to take to fix it. The "cold water sandwich" is typical for tankless heaters but can also be seen in storage tank-type. The reason for cold water sandwich effects and unpleasant showers is the temperature fluctuation and change in water pressure in plumbing. One of the situations when the burst of cold water happens while taking the hot shower is when one or more fixture is opened suddenly. What to do when hot water is not hot enough or water heater doesn't produce enough hot water? Check it out in this article. No hot water means that a water heater is not working. Repairing this problem depends on the type of water heater you have. If it is a gas type use this guide to fix “no hot water” issue, and if it is an electric type, check out this article that deals with the most common problems related to this electric type. Use this article to read about tankless problems. How many times did you experience lukewarm water after only 10 minutes of showering? What causes the problem so there is not enough hot water for your shower or dishes, and how to do repairs. Is it a heating element, gas burner, dip tube or something else? Maybe the thermostat is set too low or dip tube is broken. Here, you can also find ways how to prevent heat loss and save on energy. If there is not enough hot water your tank might be undersized or the unit doesn’t recover fast enough. Gas heats water more quickly than electric so recovery is better. Another problem which is seen often is when the water heater is located far away from the fixture, so by installing the point-of-use (POU) unit or recirculation system you can fix the problem. If the water is too hot from the tap and it doesn’t change over time, you might have a problem with the thermostat setting, which is set too high, so turn the thermostat down. If overheating happens, the temperature and pressure relief valve should open and release the pressure. If not, the situation is dangerous and requires immediate repair. The recommended temperature of hot water is between 120 and 140 F, so if it is more than that it can cause scalding burns very fast. If you are thinking is it good or bad to drink hot water, use this article and find more info about its effects on human health. Low water pressure is often found in older homes that use ½", instead of ¾" water pipe diameter. Other reasons could be the low pressure from the municipality water system or utility company, sediment deposits, even the clogged fixture aerators. Explore what are the most common heat trap problems and how to solve issues on water heaters such as the rattling noise, flow restriction problems, thermal expansion through pipes and loss of energy. In order to make the troubleshooting water heaters easier and faster, it is important to know more about each of the parts and how they operate. In order to avoid or at least reduce the damages on your water heater, experts and manufacturers recommend regular annual or bi-annual inspection. Although themaintenance cannot guarantee prevention of the damages, it can at least reduce the risk. As explained in this maintenance guide, some of the steps are needed to take and in order to keep the performance and efficiency as you would expect, and these include flushing and draining, element inspection and removing any obstructions, as part of the cleaning. The life expectancy of both gas and electric type is approximately 10-15 years, while the longest warranty is 12 years. Caution: Before you begin any repairs on the water heater turn it off, including water, gas, and electricity. Always follow the manufacturer’s instructions and review the building codes if necessary. Note: Keep in mind that some listed problems here are hard to fix and require a professional assistance. Check out this company from where you can get FREE ESTIMATES from the local plumbers. How to fix the thermocouple on Reliance? 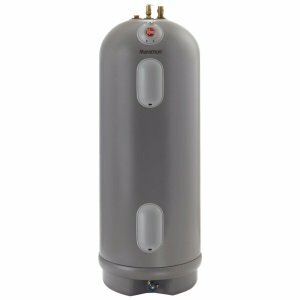 Do I have to install the expansion vessel in water heating system and how to check to I need one? Any recommendations for the brand? 4 years old State electric water heater suddenly stopped producing hot water. Why the problem occurred and how can I fix the problem?